One by one, individuals connected to the investigation have been murdered or silenced. “Wali Khan Babar’s case looks like a Hollywood movie, where at least seven people have been murdered; anyone who helped in providing any information to the authorities, anyone who was an eyewitness was also eliminated,” said Akbar, who is editor-in-chief of The Baloch Hal. Babar‘s murder trial is proceeding at a glacial pace, and little progress has been made. “In the end, we’re still waiting for a result to a trial–a trial whose venue was supposed to have been moved several times and really it’s just been inconclusive and it has been stalled because it ran up against this political wall and wall of violence,” said Dietz, CPJ’s Asia program coordinator. 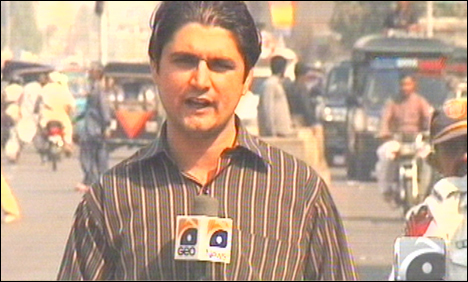 Sarwar, a prominent journalist and filmmaker, provided a wider backdrop for Babar’s unsolved murder. She said the targeting of journalists is just part of the larger culture of impunity in Pakistan, where many crimes go unsolved and unpunished–including the assassinations of Pakistan’s first Prime Minister Liaquat Ali Khan in 1951and former Prime Minister Benazir Bhutto in 2007. “It is linked to the lack of due process, where policemen are deployed more for protecting VIP convoys. They are not allowed, they are not empowered, they are not enabled to carry out investigations. They are ill-equipped, they are not well paid, they don’t have ways to really deal with the situation. This is all part of the system that needs to be changed,” Sarwar said. The author is the research associate for New York-based Committee to Protect Journalists (CPJ) Asia programme. He served as CPJ’s inaugural Steiger Fellow and has worked for CNN International, Amnesty International USA, and Human Rights Watch. He has reported from London, India, and Israel and the Occupied Territories, and specializes in human rights and South Asia. This blog was first appeared on CPJ website.